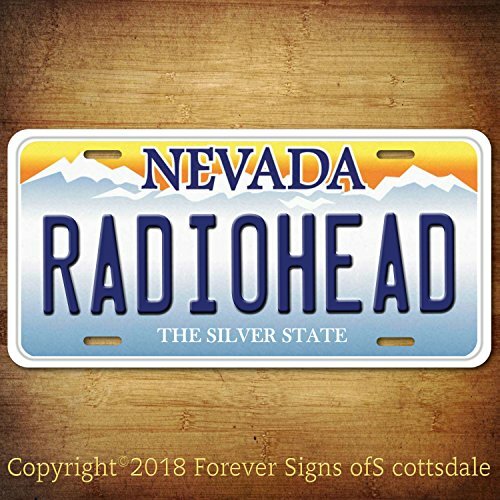 Radiohead Rock Band Nevada Aluminum Vanity License Plate Tag ***A brand-new, unused, and unworn item (including handmade items) ***This plate is NOT embossed or otherwise "raised". It is painted on flat aluminum to simulate the desired effect. **This is an all aluminum Plate with a baked on UV protection polymer surface. **It is not a cheap tin or plastic made in China plate. **Very vivid colors that are baked on for a beautiful high gloss, durable finish. ***This plate is NOT embossed or otherwise "raised". It is painted on flat aluminum to simulate the desired effect. **It is made right here in the U.S.A. By "The Sign Shop of Scottsdale" ( Scottsdale Forever Signs) If you are looking for a good quality Plate that will last a lifetime without rusting, cracking or fading you have found it. **This is a standard sized 6" x 12" License plate with four (4) mounting holes. If you have any questions about this product by Forever Signs Of Scottsdale, contact us by completing and submitting the form below. If you are looking for a specif part number, please include it with your message.